F&N has been building custom modular homes for over 22 years and the tradition of premium quality, style and cost savings continues today. 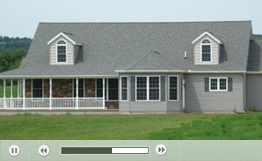 Browse our new site for modular home benefits, floor plans and galleries. If you think the words “custom” and “modular” don't belong together, you haven’t seen custom modular homes built by F&N Homes in Bloomsburg, PA. Modular homes are cost-effective, timesaving, energy-conserving, safe, and yes, customizable.